Wadi Khabb Shamsi is one of the many wadis in the rugged and spectacular Jebel Harim Mountains and it's a part of Oman Musandam that few visitors will ever see. This beautiful and long canyon starts down on the coast of Dibba Al Bay and follows it way off road up to 1200m offering tremendous views. 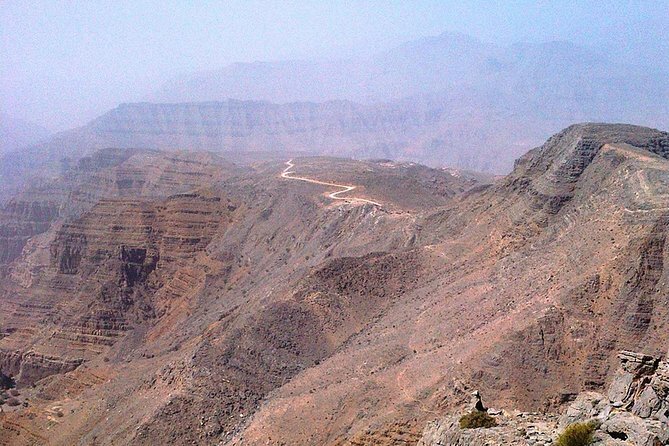 It’s well worth trip for those interested in unusual sensations & want to have a close look to the Mountains of Oman. Pick up from Hotel around 8.30am depending on your hotel location. Transfer to Musandam Dibba Oman by 4WD. On the way, we will be passing by Hajar Mountain having intense experience of Musandam Peninsula & Dibba Al Bay. You will be crossing the borders from Emirates to Sultanat of Oman, therefor, passports are compulsory on the day of the trip. Wadi Khabb Shamsi is one of the many wadis in the rugged and spectacular Jebel Harim Mountains and this is a part of Oman Musandam that few visitors will ever see. This beautiful and long canyon starts down on the coast of Dibba Al Bay and follows it way off road up to 1200 m offering tremendous views. Other than being great place to explore, the Wadi is a home to many birds and mammals resting in many shaded areas (some are shaded all day) & enjoying the cooler temperature inside the Canyon which is at least 10˚C cooler than outside. A refreshing breeze flowing through all day will make your several breaks more pleasant to take photos & to absorb the scenery. At the end of the tour, we will visit a Local Restaurant in Oman to have a succulent & Traditional Lunch & feel the Omani traditions. It’s well worth to travel to Wadi Khabb Shamsi for those interested in unusual sensations & want to have a close look to the Mountains of Oman.